The Guilty, the Audience Award Winner at the 2018 Sundance Film Festival, arrives on DVD and Blu-ray this week! 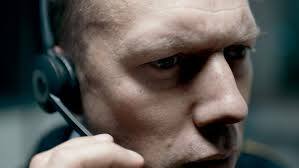 When police officer Asger Holm (an outstanding Jakob Cedergren) is demoted to desk work, he expects a sleepy beat as an emergency dispatcher. That all changes when he answers a panicked phone call from a kidnapped woman who then disconnects abruptly. Asger, confined to the police station, is forced to use others as his eyes and ears as the severity of the crime slowly becomes more clear. The search to find the missing woman and her assailant will take every bit of his intuition and skill, as a ticking clock and his own personal demons conspire against him. This innovative and unrelenting Danish thriller by first-time filmmaker Gustav Möller uses a single location to great effect, ratcheting up the tension as twists pile up and secrets are revealed. The word is that Jake Gyllenhaal is readying to appear in the upcoming American version of the film.